Shonen Knife are now in their 33rd year – or at least Naoko Yamano is. And the group are still going strong. Their new album, Overdrive, is out now. So is the first single. From what I’ve heard, SK are exploring more classic-rock influences this time (see above). But by now I think yr either in with SK at this point or yr not – nothing here will convert the unbelievers, but fans should dig it. It’s from Japan, of course. 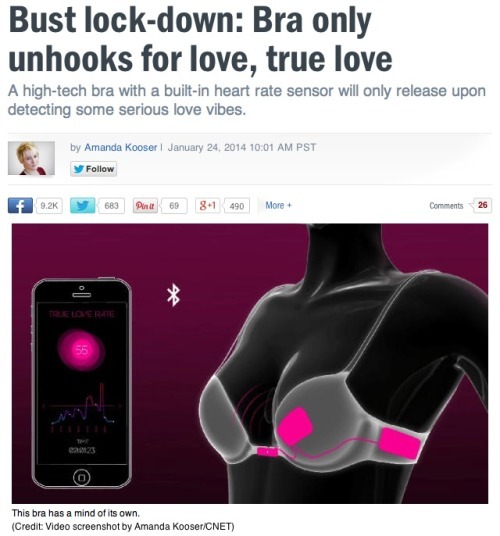 When the app calculates a change that correlates with a true-love rate, the bra unhooks automatically from the front. Video is available. And recommended. I’m assuming it’s intended to be a promotional novelty gimmick, since the obvious downside is that, True Love being the elusive, nebulous thing it is, once you put it on, you might be wearing it for months or years before you could get it off again. Unless it has an override or something. Still, as a guy, it’s fun to imagine whispering sweet nothings into a woman’s ear until her bra pops open on its own accord. Wonderful things we can do with technology these days. Current Music: The Kinks, "Hay Fever"
I don’t particularly object to this. I will say it reminds me of all the anti-Japanese sentiment in the 80s when Japanese companies started dominating the automobile market and buying out American companies and baseball teams and everyone was frightened by all this “globalization” hoodoo. I didn’t care then, and I don’t really care now. 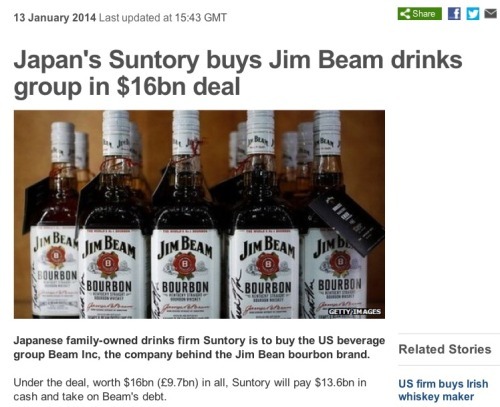 It just knocks me out to think that a product that makes a big deal of its Kentucky origins is now owned by a Japanese company. I’m sure somewhere on the interwebs (or possibly Fox News) some people are dithering over this blatant attack on American booze sovereignty. They should just follow Bill Murray’s advice and relax. You have missed us. That’s all right, you cannot help it. You love us. And so we bring you new music. And not just any new music – but the brand-new theme song for Japanese superhero Ultraman! It’s not official, of course. Like that matters. FUN FACT: The term “Salt Egg Superman” is the English translation of the Chinese name for Ultraman. It’s a reference to the shape of his head, apparently. PRODUCTION NOTE: The lyrics are actually pretty old – they were written back when Mighty Morphin' Power Rangers were still a hit in the US. At the time, some friends and I liked the MMPR action scenes, but hated the beautiful trendy American date-bait teenagers cast for the American version. It wasn’t until later that I found out that the Japanese version featured beautiful trendy Japanese date-bait teenagers. Here's a photo of the robot. I linked to the above article mainly for the headline. More detailed articles are here and here. Current Music: Valerie June, "Pushin' On A Stone"
I’ve had mixed feelings about Daft Punk for awhile. I enjoyed their debut, which added a welcome element of retro funk to the techno scene at the time. Then they decided what they really wanted was to play disco love songs, at which point they got a little less interesting for me. For their “comeback” album, they haven’t changed their musical direction so much as expanded the palette with strings, brass, live drums and plenty of guest stars. The result is a very organic sounding album. In some ways it’s an improvement, though the extensive use of vocoders and Autotune (presumably both an extension of the disco aesthetic and the duo’s insistence in pretending to be robots) can get grating, if only because everyone does that now. But there are plenty of highlights, the centerpiece of which (for me, anyway) is their homage to Giorgio Moroder. Meanwhile, the other big dance-album event of the year – at least in Japan – is the new album from Denki Groove, who have been around longer than Daft Punk and have been more prolific, but have more in common with Kraftwerk than Moroder. I tend to like their singles, and their new album has its moments. But too often it seems a little average. You can dance to it, but you can’t always groove to it. Then again, like the new Daft Punk, it could grow on me. Also, no Autotune, which is a plus. I’d share a track from the album with you, but it’s illegal unless you live in Japan. So here’s some cover art for you. Coming soon to a theatre near me: a film about a high school student who gets superpowers from wearing ladies underwear. Based on the popular satirical manga. It says a lot about me that I’d rather see this than Man Of Steel. A pachinko parlor in Shinjuku. A music store and a staircase in Ginza. A shrine on a side street around the corner from my hotel. And a few more things you can see here if yr so inclined. Not much else to report, except that music store there? I spent a lot of time in it. The same can be said for Tower Records, Kinokuniya and Yaesu Book Centre. Because, as you know, my idea of sightseeing is hitting all the bookstores and record stores in town. And so much for Tokyo. It was too short a stay, and I hope it’s not another eight years before I get to go back. I am back from Tokyo. I was there for a conference. I got bored. So my note-taking got a little sidetracked. Rugby! Zippers! Amway! Data centers! Number Six! Augmented reality! Facial recognition cosmetics! Bon Jovi! Adele! LOTS of Adele! How do I stay awake? Easy – I pretend the panel is actually Traci Lords, Catherine Bach, Judy Landers and Kitten Natividad. Yes, my questions get off-topic. Can’t be helped. Everyone gets a bento box! F*** YEAH BENTO! Eliminate the buddy system! Every crumb for himself! 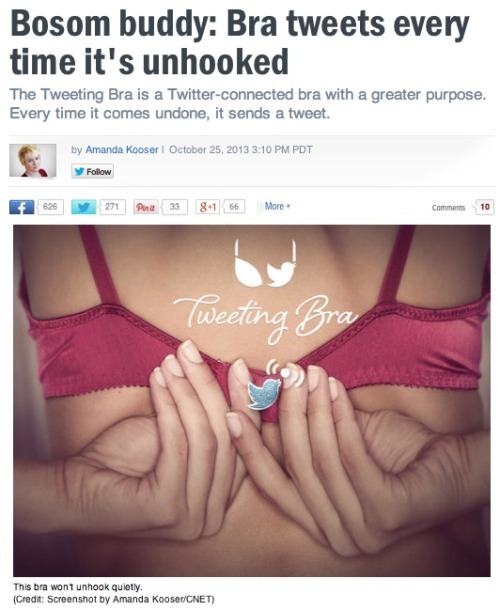 It’s what Ayn Rand would have wanted. When things start to fall apart, have an exit strategy. You don’t want to be here when the whole shithole goes up. Sterno! I am not an investment banker. I am a tax collecter. That way people like me more. Who turned off the AC? SABOTAGE! Where are the elevators? ELEVATOR CAMOUFLAGE! Leave the receivers where they are. Turn them off – they’re as radioactive as an old joke. Our building is so earthquake-proof you won’t even know there’s a natural disaster going on outside unless you look out the window. Wet bulb! Dry bulb! Evaporator pad! Recirculative cooler! Blower! Blower? I hardly know her. HEYOOOOOOOO! DC consolidation – restructure Congress, White House and Supreme Court into a single building with three offices: one for each branch. Think of the savings! At least $138m a year! SMALL GOVT! Current Music: Dio, "Caught In The Middle"
Specifically, I am in this tiny hotel room next to the Ginza. It’s been awhile. The last time I set foot in Tokyo was probably nine or ten years ago. I’ve been to Japan a few times since then, but not Tokyo. I used to travel here pretty regularly. I had a lot of fun. Of course, my idea of “fun” is spending a few hours in Tower Records Shinjuku looking for new Japanese bands. But there was also that time we went to a nightclub in Roppongi where they had a Beatles impersonation band called The Parrots. Musically they sounded just like the real thing. 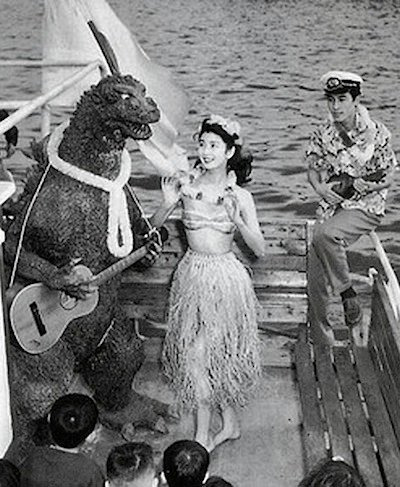 The stage banter was less so, though mainly because it’s hard to imagine John Lennon speaking Japanese. There won’t be any of that this trip, probably – I’m only here for a couple of days. But there will be a Tower Records visit. You bet. I have returned from Japan. They’re probably good for at least a dozen posts. One day I may actually post them all. But for now it seems like too daunting a task, for various reasons. Anyway, suffice to say it was a very busy week – although the reason I didn’t post anything whilst I was there wasn’t because I didn’t have time so much as I didn’t have any Internet connection. Well, not one to speak of. As it happened, my hotel had free Internet in the rooms – but only if yr laptop has an Ethernet port. And there I was with my new Mac Air, which is Wi-Fi only. And there I was in a hotel whose Wi-Fi options were limited to either a pay service that only worked about 40% of the time, or a free service that either gave you 10 minutes of connectivity every three hours, or unlimited access provided you (1) let them spam you for six months and (2) provided them with a proper email address (i.e. no Webmail), after which you had to check yr email to confirm that it was yr email address – which you couldn’t do because you couldn’t access the Internet to confirm the email address until you’d confirmed yr email address by checking yr email. There was also the option of the coin-operated Internets in the lobby. Ha ha. Very funny, Hilton. Yes. So I had very little connectivity for the whole week. Which was a fine lesson in how the Internet has permeated our lives and how challenging it is to do without it, yadda yadda yadda blah blah blah. Current Music: Dave Cloud And The Gospel Of Power, "Practice In The Milky Way"
Which I’m posting not because I feel sorry for Godzilla, but because I’m off to Japan tomorrow for a week of more telephones-related shenanigans. Specifically, I’ll be in Fukuoka, a city I’ve never been to before. And while it’s a business trip, it’s also my first trip to Japan in six years. I’ve missed it. It’ll be nice to go back. Also, the bridal unit will be going with me, which will be nice. My dance card is pretty full, so livebloggery will be sporadic. But if LJ gets hit by another DDoS attack, you won’t notice anyway. Current Music: Baby Boy Warren, "Bad Lover Blues"
And here’s what I watched this weekend: a ninja babe fighting a horny latex alien. It’s from a film called Alien Vs Ninja. The title speaks for itself. As does the scene, really.